The Hair Dryer Stand saves time styling, straightening, and drying. The Hair Dryer Stand saves time styling, straightening, drying, and volumizing your hair. 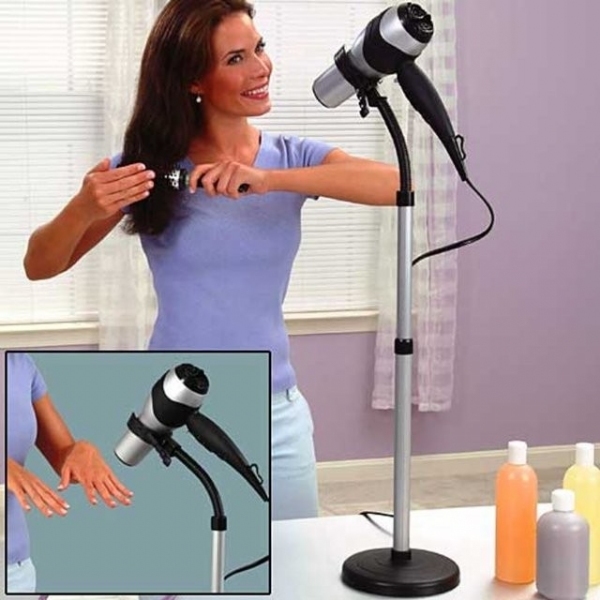 This unique blow dryer stand frees both hands so you can be done styling in record time - styling hair made so easy! Achieve that "salon look" every time! Now you can eliminate the fatigue of holding that heavy hair dryer! Recommended by professional stylists for all hair types, the simple to use hands free hair dryer stand is designed for counter top or vanity. It easily adjusts to accommodate users of any height. The flexible gooseneck allows you to bend and focus air at any angle; now drying the back of your head is so easy. Use the Hair Dryer Stand once and you will be hooked for life! Styling hair made easy! Features: Adjustable strap holds most hair dryers. Flexible neck holds hair dryer at almost any angle. Telescoping neck adjusts to any height up to 36", Allows hands free operation so you can worry about your hair, not the hair dryer! i had a stroke and this has been the best helper. easy to use while sitting down or standing up. I would recomment this product, I have fibromyalgia and chronic fatigue and this helps me very much. I use this when I come out of the shower. By the time I&apos;m finished putting on my creams, my hair is almost dry. Great time saver. I just style from there. I also have a bad back - this lessens any strain on my back. I&apos;m now buying my second one. After at least 10 years, I need another one. I have RA, so it&apos;s hard to hold items for very long. With this product, I have pain free hair care.